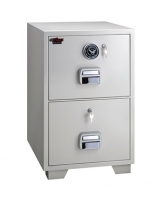 Protect your important and confidential files from theft and damage with our high quality, fireproof safes and cabinets. In a professional environment, it’s essential that important documents are organised and protected from an incident. Our metal file cabinets come with a lock for maximum security, and durable material that won’t go up in flames in case of any emergency. 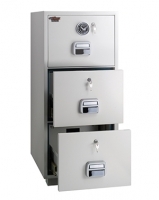 Our file safes come in a range of sizes, including double drawer cabinets that can easily be confined under desks to our four drawer cabinets that are ideal for larger businesses. With a wide variety of products, our fire resistant file cabinets will keep your private documents protected in any circumstance, further protecting your company and brand’s confidential information. The Eagle Fire-Resistant filing cabinet offers a smooth and quiet suspension filing system, protecting important documents from fire. It offers up to 90 minutes fire protection, certified by SP NT-Fire 017 90P at 925°C. Each drawer is insulated independently, to stop fire from spreading to other drawers. It features a central locking system, permitting the locking of any of the drawers independently and collectively, with the Master drawer at the top. Comes with either a mechanical resettable combination lock, or an electronic keypad. As well as a key lock for each individual drawer. 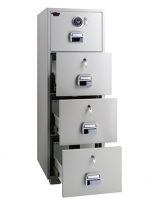 If you wish to discuss any of our file cabinets in detail, be sure to contact us as soon as possible so we can get your secure safes ready. We also have a range of night deposit safes, data media safes and more, so you can secure everything you may need protected. Give us a call on 6275 4088 to speak to our team in Singapore, or simply fill in your details online.